One of Canada’s largest privately owned steel fabrication and piping facilities has expanded its services to include construction of pipe system modules. With the help of Innovator staff and technology, the new service is taking off. Constructing pipe modules is second nature to this company’s experienced workers. 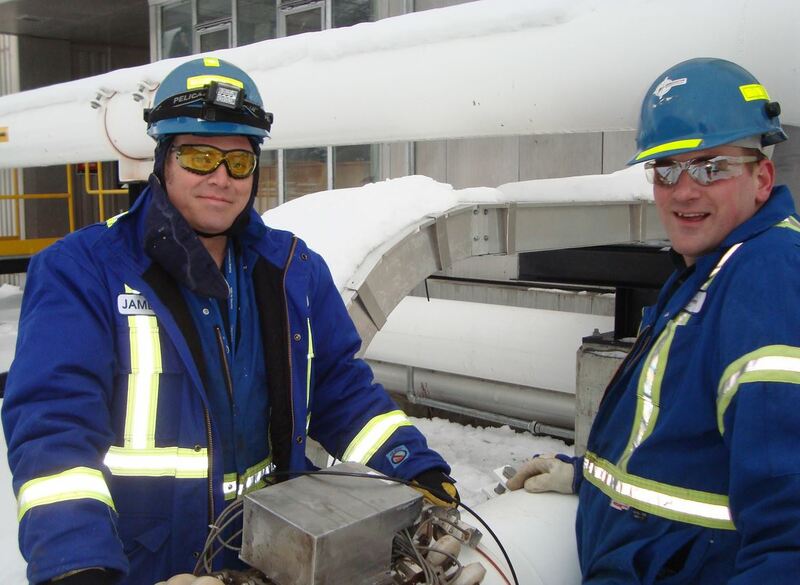 However, all pipe modules must also be fully hydrotested and certified to the standards of the pressure equipment safety authority for Alberta, ABSA. Because the hydrotesting technology was new for this company, its testing teams were having trouble keeping up with the volume of modules they could produce. Innovator was called in to increase their capacity. In a win-win arrangement, Innovator’s technicians took over the hydrotesting for an entire job. This was a much more efficient use of time, and it allowed the company’s crew to focus on their core business of fabrication without any hydrotesting distractions. Evan Linehan, job coordinator at Innovator, explains the secret to Innovator’s efficiency. “We are flexible and make real world improvements to systems and procedures,” he says. Innovator’s five-man team completed and returned 46 tests in just eight days — providing nearly 600% improvement in time and manpower costs. In this case, Innovator teams pre-configured and installed high-pressure, quick-change, self-sealing fittings to streamline the testing process. “It’s a time-saving fitting that we currently use,” says Linehan. The results were dramatic. The company’s 30-man team had planned to complete 46 tests in 21 days. Innovator’s five-man team completed and returned 46 tests in just eight days — providing nearly 600% improvement in time and manpower costs. Innovator staff doesn’t expect to have standby time during the day; technicians would rather be working. As teams are cross-trained to perform any service that Innovator offers, the on-site team offered to help in ways that the steel fabrication company didn’t expect. “We’ve been able to help with flange facing and hot tapping. The client didn’t know our team could also do those jobs, so they were pleasantly surprised,” says Linehan. “Our team will help our customers in any way shape or form that we can when we’re there. If we have a procedure to help and they’re willing to let us help them, we will pitch in. We’ll even sweep floors and pick up garbage,” Linehan adds. And he’s not joking! The Innovator philosophy is to give clients full value for their dollar. Whenever the Innovator staff is being paid, they want to keep busy. He continues, “Our employees are well aware that if they sit around for a few days, they will lose momentum and it takes longer to get back up to speed after downtime. If you’re not working, it just makes the day go by slower. “No matter what the job is, we come up with resolutions to what our customers call ‘problems,'” Linehan says.